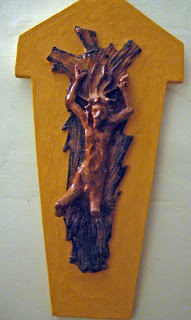 Man Crucified is a dried clay work done some time ago. It symbolised the suffering of man as a whole. The effect of the way the modelling was performed hopefully show what sufferings is all about. I suffered while doing this work too.